You must not miss Kuru Fasülye, turkish bean soup, because it’s such an important part of Turkey’s history and culture, that you almost have to taste it (even if you are not so fond of beans). Etli Kuru Fasülye means literally “soup with dried beans and meat” – something which most Turks can afford and always have at home. That may have helped to make it Turkey’s national dish (and it really doesn’t taste bad especially on a cold winters day). My Turkish mother in law has often made this dish, when the whole family get together ex.a Sunday afternoon. The dish is both easy and pleasant and only gets better standing from the day before. The soup is often served with nice Turkish rice, a little light salad and good bread. This dish is for 4 people – and perhaps a bit for lunch the next day. 2-3 large teaspoon tomato puree (like the real sun-dried tomato puree, which you get at some Turkish greengrocers or combined with 1 good teaspoon pepper puree, which can be purchased in several places). If you can not find the turkish one, then you can perfectly use the normal one, you get from the supermarkets. The white beans should be put in water the day before you want to cook it and then cook them in fresh water for about 30 minutes. 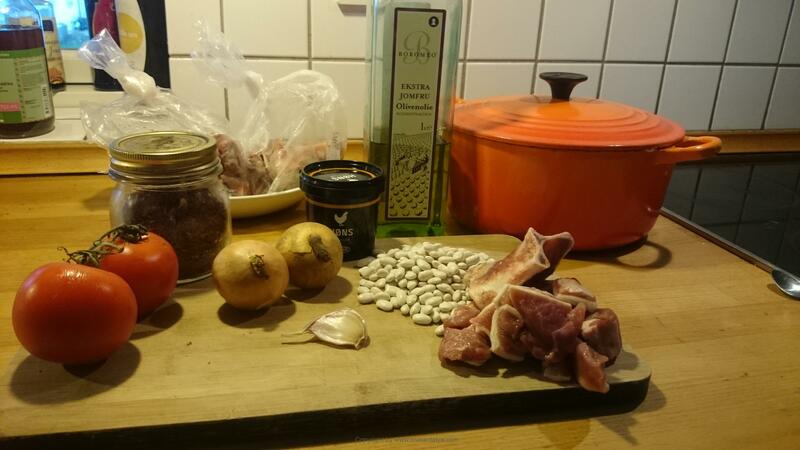 Drain (so you avoid getting really sore stomach as beans contain lectins). You can read more about it here. Chop the onions into small cubes and fry them soft in the butter / oil along with lamb. Add tomatoes and tomato purée, season with salt and pepper and stir. Add the beans and bones (and pepper and pastrami, if you selected it) and stir again. 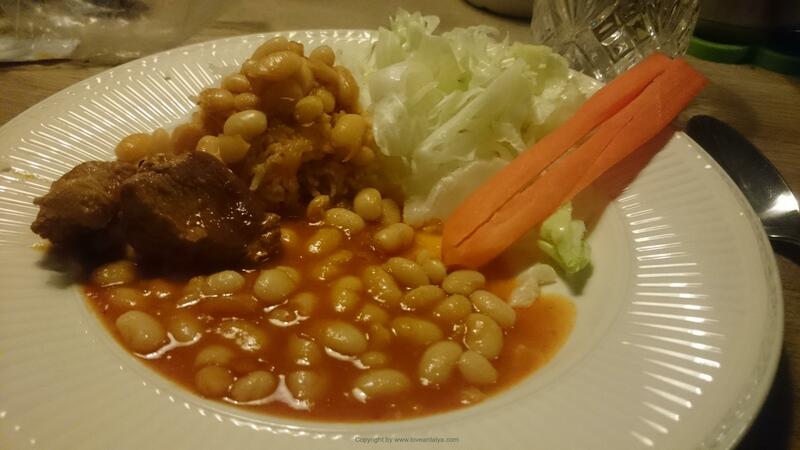 Add enough water till it cover the beans and the meat with about 1 cm. The soup is allowed to be quite thick, but the you possibly have to add a little extra water along the way. 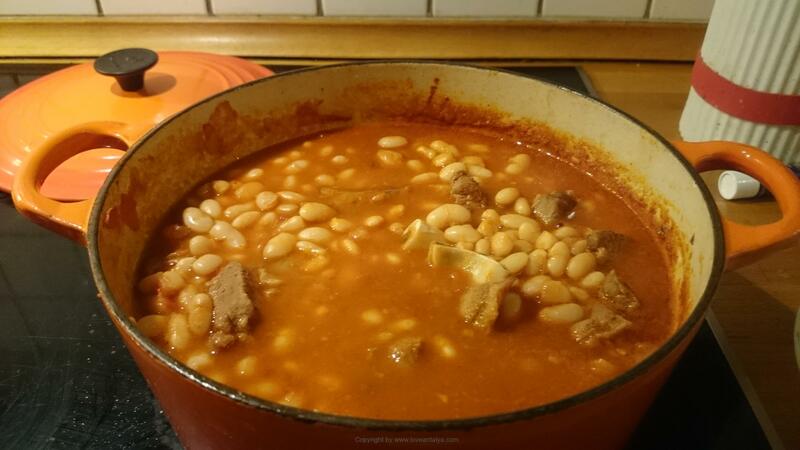 The soup should be cooked for an hour, but watch out for the beans, so they don’t get mushy out. Meanwhile, prepare rice and salad, so it is ready, when the soup is finished. Enjoy a glass of wine and take a break while it all buzzing around you. Before watching you, the soup is finished.